This needs to be dished up the moment its made, before the courgettes start ‘weeping’ and losing their freshness, so don’t let it sit around for too long. 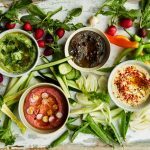 It goes well with hot food fresh from the grill or alongside a bunch of meze. Put the oil, thyme, lemon peel and garlic in a small saucepan on a low heat and leave to infuse for eight minutes, until the oil becomes aromatic and the garlic, lemon and thyme start to colour. Take off the heat, leave to cool, then strain the oil into a large bowl. Pick the leaves off the sprigs and add to the oil; discard the sprigs, lemon and garlic. 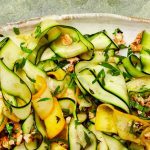 Put the courgettes, walnuts, lemon juice, a third of a teaspoon of salt and plenty of pepper into the oil, then massage the courgettes for a minute or so – they will break up a little – then stir in the basil and serve at once. A salad that travels well and is more than a sum of its parts. 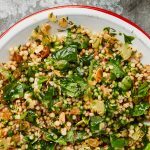 Rice, quinoa or normal couscous can be used in place of the giant couscous if you like. Soak the raisins in the vinegar and leave to one side. If you are cooking your lentils yourself, then cook in boiling water for 20-30 minutes until soft but still holding their shape. Cook the giant couscous in boiling salted water according to packet instructions, then drain well. Make the dressing. Toast the cumin and coriander seeds in a dry pan for a couple of minutes, until they smell fragrant. Add the ground spices, stir quickly, then take the pan off the heat and tip the lot into a mortar. Bash with the pestle until they are broken down a bit. Tip into a jam jar, add all the rest of the dressing ingredients and shake to mix well. 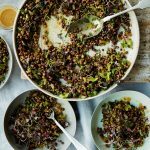 Drain the lentils and put in a large bowl with the couscous, chopped celery and dressing. Roughly chop most of the herbs on a board, drain the raisins and add to the pile of herbs, chop the lot together, then add to the lentils. Season with salt and pepper, mix well and taste, adding more salt, pepper, lime and oil as needed. Remember, it will mellow a little as it sits. When you are ready to eat, scatter over the rest of the herbs and any celery leaves, and pile into bowls. Great on a sandwich and also work in a salad or as antipasti. If you have any of the aromatic oil left over, it’s great on pasta and salad. Heat the grill to its highest setting and put a rack at the top of the oven. Cut the fennel in half lengthways and then into 1.5cm-thick batons, keeping some base attached, so the pieces hold together. Gently toss the fennel in a teaspoon of oil and a good pinch of salt, then lay out on a large oven tray. Toss the aubergines in a teaspoon of oil and a good pinch of salt, and lay cut side up on the same tray. Grill for 12 minutes, until well charred, then transfer the aubergines to a large bowl. 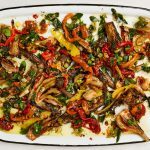 Turn over the fennel pieces, grill for another six minutes, then add to the aubergine bowl. Turn off the grill and set the oven to 220C/425F/gas 7. Put the peppers and chillies on an oven tray lined with baking paper. Drizzle a little oil over the garlic bulb, sprinkle with salt and pepper, then wrap tightly in foil and add to the pepper tray. Roast for 25 minutes, turning halfway, until the peppers are blackening on both sides. Remove the peppers and chillies, and roast the garlic for 10 minutes more. Put the peppers and chillies in a bowl, cover tightly with clingfilm, leave for 30 minutes, then peel off the skin, discarding the seeds, stalks and any liquid. Tear the peppers into 8cm strips, roughly chop the chillies and put both in the fennel bowl. When cool enough to handle, unwrap the garlic and squeeze out the flesh into the fennel bowl. Add the remaining oil, the last six ingredients, half a teaspoon of salt and a good grind of pepper, and mix gently to coat. Ideally, leave . This is just as good eaten at room temperature as it is warm. It’s an ideal portable meal, because it can be made well in advance, it’s easy to transport and it will keep for hours. Put the couscous in a medium saucepan for which you have a lid, and dry toast, stirring occasionally, over a medium-high heat until some of the pearls begin to colour – about four minutes. Add the stock and a half-teaspoon of salt, bring to a boil, then cover and turn the heat to low. Cook for 10 minutes, until all the liquid is absorbed, then turn off the heat and leave the couscous to sit, covered, for 10 minutes more. Meanwhile, finely grate the lemon peel into a small bowl – you should have two teaspoons of zest. Using a small, sharp knife, trim the top and tail off the zested lemon, then cut away the skin and pith. Release the lemon segments by cutting between the membranes, then cut each segment into rough chunks and add to the zest bowl with any remaining juice squeezed from what’s left of the lemon – you need about a teaspoon. After the couscous has rested, stir in the lemon mix and the oil. Put the raisins in a bowl, cover with about 100ml boiling water, leave to soak for five minutes, then drain. Mix the raisins, cumin, almonds, herbs, a quarter-teaspoon of salt and a good grind of black pepper into the couscous. Put all the ingredients for the parsley oil in a blender with an eighth of a teaspoon of salt and blitz until smooth. Pack the couscous into a portable container and spoon the oil on top (though, if you’re serving this at the table, spoon on the oil just before you eat). Heat the oven to 180C/350F/gas 4 and line two large oven trays with foil. Chop the onion from above into wedges, separate into “petals”, then arrange on one half of one tray. Break down the cauliflower into bite-sized pieces and put these on the other half of the tray. Cut the aubergines lengthways into quarters, and put them on one half of the second tray; lay the tomatoes on the other half. Whisk four tablespoons of oil with a teaspoon of salt, pour this over all the vegetables, then toss with your hands to coat all the surfaces and get into the nooks and crannies. Bash the garlic cloves with the back of a knife and put on the aubergine tray, then roast the onion and cauliflower for 20-25 minutes and the aubergine, tomatoes and garlic for 30 minutes. Meanwhile, wash the rice in a sieve under the cold tap until the water runs clear, then tip into a large saucepan. Drain the chickpeas, add to the rice, then cover with plenty of cold water and bring to a boil. Turn down the heat and leave to simmer for 18 minutes, or until tender. Drain into a sieve, then cover with a clean tea towel and leave for 10 minutes. Now make the dressings. In a small bowl, mix the tamarind paste, date syrup and oil with a tablespoon of water. Add the chilli, cumin and a quarter-teaspoon of salt, and mix again. Put the yoghurt in a second small bowl. Squeeze the flesh from the roast garlic on to a board and finely chop, then stir into the yoghurt with a quarter-teaspoon of salt. 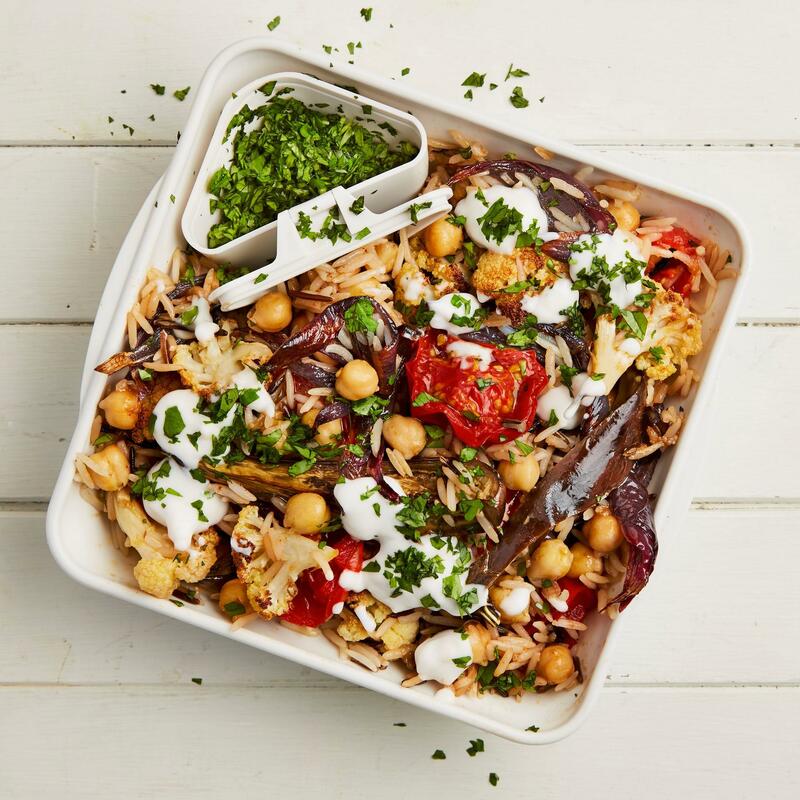 To bring the salad together, in a bowl mix the rice and chickpeas with the baked vegetables, toss with the tamarind dressing and transfer to a portable container. Serve drizzled with the yoghurt dressing and scattered with coriander.